"Scrumptious, soft, blonde brownie recipe filled with M&M's®, Butterfinger®, Reese's®, Hershey's®, and others! You will enjoy every bite! Feel free to use any variety of candy!" Whisk 1 cup plus 2 tablespoons flour, baking powder, and salt together in a bowl. Beat brown sugar, butter, and vanilla extract together in a separate large bowl using an electric mixer until creamy; beat in egg. 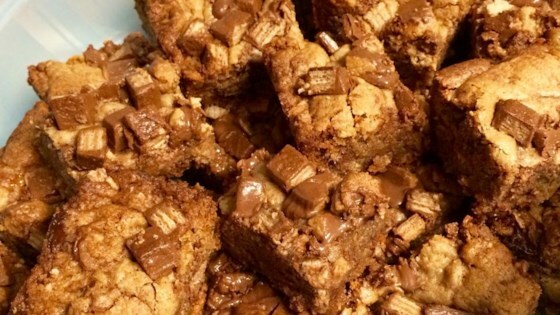 Gradually beat flour mixture into butter mixture until batter is just combined; fold in candy-coated milk chocolate pieces, peanut butter cups, chocolate-covered crispy peanut butter candy, and milk chocolate bars. Press batter into prepared baking pan. Bake in the preheated oven until golden brown, 20 to 25 minutes. Cool in pan for 10 minutes on a wire rack. If you want it a little healthier, use Smart Balance® butter instead of regular butter. I made these, but for some reason, the actual brownie part was vanilla, so it was vanilla brownies with chocolate chunks. They didn't really turn out the way I hoped. We made these with only m&ms and chocolate chips and they were still delicious- my kids love them! I think it's more of a cookie bar than a brownie. Delicious! I used Twix. Great recipe! I just used a mixture of candy that came out to 2 cups. It came out well and I will use this again!